As I’m writing this, the April 10 ACT is only 2 days away. While this site is called SAT Success Secrets, I tutor a lot of kids for the ACT as well (it’s just less popular here in Los Angeles where I’m currently located). 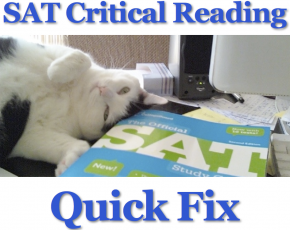 In order to help students around the country who are preparing to take the ACT, I’ve modified my popular “6 Tips for Last Minute SAT Preparation” post in order to give you the same coaching advantage that my SAT students get. So whether you’ve left everything until the last minute, or you’ve worked hard and want a few last minute pointers, here are the essential last minute ACT prep tips to help you make the most of your remaining time before the exam. Last Minute Tip #1: You already know most of what you need to know to do better on the ACT than you might think. Remember, the ACT is not rocket science. You already know how to read, you don’t need to know anything special to do well on the Science section, and by now you’ve probably learned most of the math, grammar, and punctuation that you need to do well on those sections of the exam. Last Minute Tip #2: Confidence is king. Henry Ford, the guy who started the car company, once said, “Whether you think you can or can’t, you’re right.” You have to believe that you’re going to be successful. Why? If you believe that you’ll do well, when you have trouble with certain questions, which you inevitably will, you won’t get frustrated and lose your focus. That brings us to the next tip. Last Minute Tip #3: Relax and stay in control of your emotions. If a particular question is giving you a hard time, skip it and let it go. It doesn’t mean anything, especially anything bad about you. I’ve seen a lot of students make mistakes and then feel bad about themselves. I’ve done it myself many times in my life. It’s not worth it though. It doesn’t lead anywhere good. If you dwell on the questions that give you trouble, or even take too much time on them, you’ll just get lost in negative thoughts and emotions and lose the focus that you need to do well. When you take the test, treat it like a video game. You don’t get upset when you’re learning a new video game, do you? You certainly don’t stay upset for more than a few seconds. Last Minute Tip #4: Focus. Focus is the most important factor in getting the best ACT score possible. In fact, the reason that the previous tips are so important is that being confident, relaxed, and in control of your emotions are what allow you to stay focused. Answers that seem right but are actually wrong are built into every section of the test. That’s why focus is so important. When you’re taking the ACT, if you’re not paying full attention at every moment, you’ll get questions wrong when you know how to get them right. Whether you’re starting with a 21 in each section and working toward a 24, or you’re starting with a 32 and working for a perfect score of 36, focus gives you the most bang for your buck. It’s the absolute, number one key at all score levels. Last Minute Tip #5: Make yourself laugh. If you notice that you’re feeling tense or frustrated, think of something that makes you laugh. It’s the number one thing you can do to change your emotional state from negative to positive. Last Minute Tip #6: Practice all you can until Friday afternoon. Take some practice tests using official ACT material from ACTstudent.org, and work on your weak points. Download the free Official ACT Practice Test; from the ACT website , use their additional practice questions, purchase their online prep course, or get their official study guide called “The Real ACT Prep Guide”. Practice the other tips as you go through the material. Good luck on Saturday. Let me know how it works out. I took the ACT a few months ago and I got a 21. I feel like I could do better, so I’m taking the ACT next Saturday and I’m aiming for a 24-26. The only issue is my ability to comprehend what I’m reading when I have to read really fast. I find myself trying so hard to read the passage in time that I don’t actually understand anything I just read. Should I just read the passage slower and risk running out of time? Or should I practice reading faster? Please let me know what you think any and all tips are always appreciated! That’s a great question. If you don’t understand anything you just read than when you get to the questions you’re toast. You have to read slow enough to get the point of each paragraph and the point of the passage as a whole, but you don’t have to understand every word or sentence. In fact, there won’t even be questions about most of what you read. Let’s look at Passage II from the current official ACT practice test. Download it, read this passage, and then follow along. 1) The Saragasso Sea looks calm on the surface but has grand energies below. 2) The depth of the ocean (it’s surprisingly deeper near coasts than in middle), what’s on the ocean floor, and how early sailors measured it. 3) No one could explain it. Transatlantic cable workers pulled up the freshest rock on earth from the foundation of the sea. 4) Today we know that there’s a big underwater mountain range down the middle of the Atlantic ocean. 5) There’s a valley or canyon in the middle of this mountain range where fresh lava is coming onto the sea floor. 6) There are volcanoes under there powered by heat from when the earth was born. Here’s the point of the passage: There’s a really big mountain range under the Atlantic ocean, running it’s full length down the middle, that’s made by currently active volcanoes powered by heat from when the earth was born. The author thinks this is really cool. That’s all the info we need to answer most of the questions. Note that you don’t have to use the same words I’m using. 11) A – the author thinks this is cool. 12) J – the whole passage is about the mountain range. 13) C – the surface looks calm but there are grand energies below. 14) J – the canyon runs the length of the Atlantic ocean, which is longer than the grand canyon. 15) B – this doesn’t come from what we wrote, but the question gives you specific line numbers to go back and reread. 16) H – the volcanoes are underwater and powered by heat, so it’s not J or G. You have to look back to see that it’s H.
17) B – it’s surprisingly deeper near the coasts than in the middle. 18) F – this doesn’t come from what we wrote, but the question gives you specific line numbers to go back and reread. 19) D – it’s really big, so A & B are way too small, C doesn’t make sense. 20) F – this doesn’t come from what we wrote, and there are no line numbers, so it’s harder to find the answer to this question. As you can see, there’s lots of stuff you don’t have to know from the passage. Keep practicing and you’ll find the right speed and reading accuracy for you. I only need an 18 on my act I took my last act and got a 16 I did well on the sciance and reading portions social social studies and reading caused a lot of stress. I get too overwhelmed and my brain kinda shuts off. I try to focus but I just start to blank. Im a high school senior Help! I can’t quite understand all of this because it looks like you have some typos here, but I know, as you point out, that stress shuts our brains off and makes it hard to focus. The key is to practice in a relaxed atmosphere and learn how well you can do when you’re not worried about your score or the pressure of taking a timed test. If you can reach the score you need when you’re not stressed (and I’d bet you can), you’ll realize that you’re only stressed because you’re worried you won’t reach your goal, and you can reach your goal, so there’s no reason for the stress and it’ll go away on it’s own. Does this make sense? Try it and let me know if it helps. Hello, I am participating in the 7th grade talent search where I have been chosen to take the ACT. I am about halfway through Geometry so I don’t have experience in most of the required math. Proofs aren’t on the test. The ACT is two weeks away and I need help! I also have the AWA and NESA tests coming up. I really only have a half an hour a day to study. I’m confident in my reading and english skills, but not so confident in my math skills. Does anyone have any tips on studying? I am aiming for a 32 or above. I know that sounds pretty high, but I know I have it in me to get it. This is my only chance to prove at this age, I can do better than the average Junior. I want to get into MIT, Cal Tech, or Northwestern for Neurophysiology. Only one person in the history of MIT got accepted with an ACT score below 28. It would mean so much to me if I got a 32 or above. That would give me more than a 0.9% chance of getting into one of those colleges. Please help me! You’re in 7th grade. Relax. Don’t sweat this until the summer before your junior year. Hi I am a seventh grade honors student and qualified for a Duke academic talent search and must take the ACT’s *or* SAT’s (my choice). I think I’ll do the ACT’s. I do not know as much as an eleventh grader, but I am good with educated guessing, process of elimination, etc. Still, there might be questions I’ll have no idea what it’s talking about. I am taking ELA and math. What all should I study? I have until December to get prepared. What do you think I should focus on? I took the act 3 times total, the first 2 times I got a 23 and a 24. I went in the third time, with a lot more confidence, calmness, and took the test more lightly than the previous two times. I got a 32. I had the same prep before each test. listening to music can help boost a lot of confidence. It helped me! Just go in feeling good. Take it lightly…It’s only a test… you can always try again! hey whatsup man i take the ACT on Saturday, Today is thursday. I’ve been studying and studying hard. All i need to do is crack a 18 on the ACT reading section to get my graduation diploma. I’ve gotten a 17 my first time. But i need this 18. The reading is toughest for me its the long passages and staying focus enough to answer the right questions after i read. Any tips my man!? There’s not much you can do about focus, other than to focus! A lot of it is just having the maturity and the desire to do it. What you can do is learn to be aware when your focus slipped and you started to think about something else when you read. When you notice that, don’t get mad at yourself, which is really important, because it just makes the situation worse. Simply go back to the last thing you remember and start reading again. Good luck! For Math, read the posts about the SAT math section. The same principles apply. A lot of times, people think they’re having trouble with the math when they’re really having trouble focusing clearly enough to answer all the questions they already know how to do. Since you’re taking the test soon, I would recommend that you focus on that. Also, don’t get bogged down on difficult questions. Skip them quickly and make sure you answer all the questions you know how to answer. Then if you have time, go back and try the harder ones. Leave a couple of minutes at the end to guess on any remaining questions since there’s no penalty for guessing on the ACT. For the Reading section, also make sure you skip the ones you’re having trouble with and make sure you get to the ones you can answer, just like I described for the Math. Other than that, you can probably read a little bit faster than you think you can and still understand the passages, so if you’re having trouble with time, try that. If you have specific questions, you’re welcome to send them to me using the contact page. I hope that helps. Let me know how it goes!